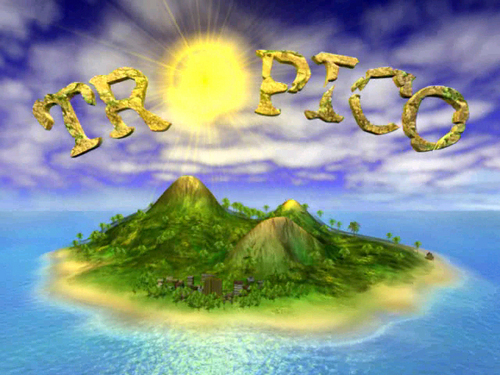 Tropico for PC is a Caribbean island simulator, sort-of, it almost crosses the line into overly realistic. You are a dictator whom is cooped up in his palace, and runs the island with an iron first, mostly. At heart, despite trying to be a dictator, you are more often than not a pawn of the people, as I shall go into in more detail. I’ll start off by going through the modes, and you’ll get a feeling of how the game plays from that. Build Mode: Here you lay down buildings. The interface is slightly unintuitive. For example, some buildings have an arrow next to them that lets you rotate them. Yet, I’m not sure why this doesn’t appear on all buildings. Are some square and so the turning is negligible? I’m not sure. Even if this were the case, I should still be able to change the facing of the building for my own personal satisfaction. Nothing requires being set next to a road, but I would still like to perhaps makes things face a road for atmospheric reasons. 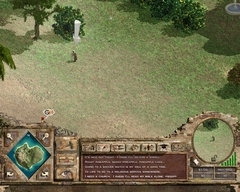 The elusive arrow has another function; on some buildings, such as farms and mines, it will switch which type of product will be produced from your placed structure. Thus you don’t have to go and change it once it is built, though you can. You cannot rotate these buildings since the arrow occupies the same space where the rotation would be. The developers could have Ameliorated this with two different graphics for the different functions, or at least moved them around. They should also let me rotate buildings with type selectors as well. Once a building is placed, you have to wait for some construction crew to come by and build it. This can take a VERY long time. The reason for this is that the crew do not like building things far away from them. Thus you’ll have to build a couple of construction crews throughout your city. 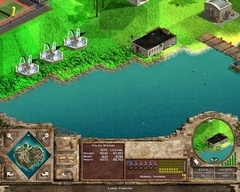 They will build closest objects first unless you change the priority of the buildings, thus you will want to place one in the center of your city’s extensions. Thankfully the developers included this option otherwise some buildings would never BE built. It is changed by clicking on buildings under construction and choosing one of 4 priority settings. Also, I believe walking tires them, so when they do reach your far out building, they may only work for a little while before heading home. Finally, after all that is complete, the building can finally be constructed as its yellow building hue becomes fuller and the building pops into place complete. Construction in this game is very crucial; everything revolves around it, and yet is hindered by inclement mechanics. Thankfully the rest of the game is more pulled together. Ways to make money: Now that you know how to build things, you need to know how to make money, and feed your people. This is done by building structures, which are occupied by workers, and ultimately ship a product. Besides building placement, you don’t have to worry too much about most of the steps in the industry. 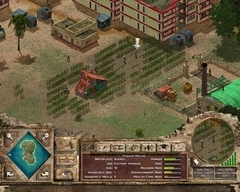 Farming - Farming in Tropico has several levels of realism to it. Clouds fly overhead, and change the fertility of the soul. They rain and help the crops. Thus, you must place your farms where they are going to be growing in correct conditions. Luckily when placing a farm, and any resource gathering building, the ground changes to shades of green and red to show where the most suitable places for that building are… at that time. Corn is the easiest to grow of the foods, and usually most of your island is cultivated with this resource. However, it doesn’t make the most money. The rest of the crops are more profitable, yet have more specific growing conditions. One thing I must mention is that you don’t want to place the farms ON the green parts of the map when choosing the fertile land. This is misleading, but your crops are grown on that green, so the workers will plant it there, and they can’t do it if you have just placed a farm on it. It took me forever till I realize this. (I tend to ignore tutorials). Finally, your crops go through a cycle of growing, filtering and harvesting, which have different animations, and are satisfying to watch. Out of all the things included, it seems that farming was a place where assiduity was placed. Kudos. I must mention one thing I did not like about farming. You must grow food to feed your people, yet, you cannot control which food goes to your people, and which goes to your exports. Thus, you might be planting papayas and bananas to export, and your people are eating your expensive produce. Arrgg. A little clicker button for Export only would have been nice, especially when so much else was done. Mining, Logging, Fishing – Easy resource gathering economies. Just place the building, and the workers take care of themselves. Mines should go near the places where the resources exist. Logging camps should be placed near trees, and fishing near the shortest distance towards the best fishing hole. Fish can be fed to your population, but once again, you cannot control export/local feeding. Trees cut down by the logging camp are renewable to an extent though are sparser than the original tree placement. What is cool is that each tree that has fallen has multiple sections that are cut out. So one tree is not just one log, many of the tree cutters can come by and collect sections of the fallen tree; another welcome attention to detail on the part of the developers. Ranching – I wanted to mention this one separate from the 3 above. Granted, it is like the others, you just place it down and they take care of themselves, but more micro-details make me fill with glee. I love these micro-simulations because they remind me of the old Maxis games; but enough reminiscing. Ranching is cool because you have a choice of cows or goats. The cows and goats can have children, which will eventually grow up to build up your Bovinian empire. You start each ranch with about 2 cows, and from there they multiply out. The best part of the simulator is the fact the cows and goats terra-form the terrain in real time. You can watch them eat the green landscaping as it transforms to barren brown. It is quite fascinating, and at the same time puts a maximum on the amount of cows you can have. They work to find the green, but eventually they will eat your island bare if there are too many. I guess it is almost representative of the world at large now, but perhaps I’m thinking too far into it. Industry - All the things listed above are basic money makers. You can dramatically increase your profit margins if you take the raw resources and transform them into things. That is what canneries, cigar factories, and jewelry makers are built for. Granted, it takes more people, and for some reason these structures require workers with high school educations (It beats me why. You have guys cutting down trees but they can’t make a chair out of it? ) At this point, the money made from these structures usually puts the player out of needing money the rest of the game, assuming you don’t spend like a madman or get hit with a hurricane. Tourism – I’m not sure if this existed before the expansion or not. If it did, the expansion heavily increased the available options for it. 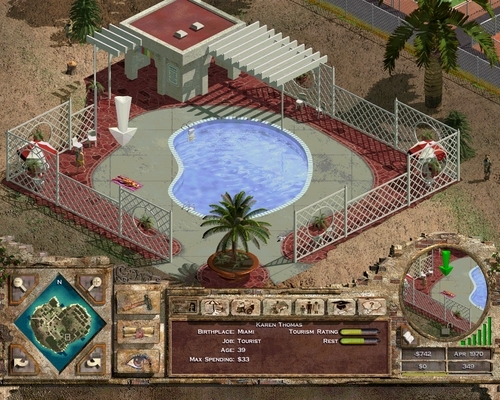 Basically, you have to build special structures, like hotels and resort sites. I never fully grasped the intricacies of making money through it, and with the much easier methods of farming/ranching available; I didn’t see much need, unless the mission required it. However, there are a lot of options for hotels and entertainment. Unfortunately, the local populous tend to ignore these places themselves, so in vanilla games they tend to be widely useless. It would have been nice if once again there was a button to make the tourist place a pure local entertainment building. Why can’t my farmers play mingolf?! The expansion adds new tourist types, which I’m not sure affect much except they have new sprites, sounds and varying types of money. Always good to have more people types just to break up the monotony. Those are pretty much the major ways of making money. Other ways exist, such as in the output of the entertainment venues you place, and newspaper coupons but they are usually not enough to keep your island growing productively. You can make money though US/CCCP stimulus, but the same idea applies. The People/Factions: Each person has a set of motives which they follow. 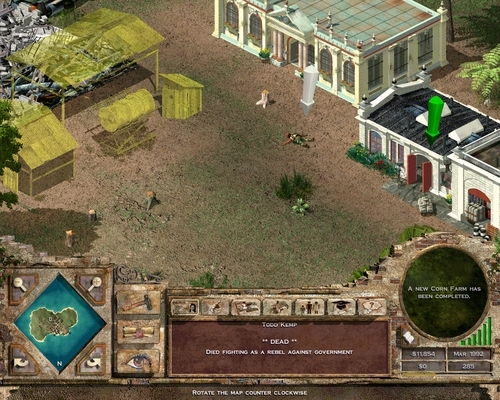 These include things, such as food and rest, the two basic needs of Tropicans, as well as entertainment, health, and religion. These contribute to overall happiness. There are more, such as liberty, housing quality, environment, crime that also contribute. Overall, a lot to keep track of. And this is why I tend to juggle them poorly. Not only that, but each person may be part of a special faction, such as the militants, communists, environmentalists etc. These people feel more strongly about those motives and so if you are failing in those categories, it carries more weight on their overall happiness. In this way you have to build your infrastructure so that buildings that satisfy the needs are not too far from each other. Therefore, you might have to build a church, a clinic, marketplace and housing right by each other so that the people can satisfy all their wants. This makes for a lot of duplicate structures being needed at the end of the day. But wait, there is more. People also want good pay relative to other people. But of course you can’t have everyone making the max amount of money or else the relativeness is null. Furthermore, people want jobs that fit their education. Thus you need to make buildings that satisfy the jobs. Luckily, churches and clinics need high school and college educated people respectively, so you’ll always have those to fill as you need to have many to serve the masses anyway. People also have stats, such as intelligence, courage and leadership. Education level decides what jobs are available for that person to occupy. There is also a “skills” group which shows how skilled the selected person is at each job. They don’t even have to be human; more skilled goats find greener grass better than unskilled goats. The higher the skill, the faster and better they do their job. More educated people learn things faster. More courageous and leading people will rise up against your government more readily if you do poorly. Besides the information that is vital, there are a couple ever sections that show up per person. You can see a list of “thoughts” which tell you what the character is going to do/joke comments. You can also see the nearby family of the person, (No Sims Family Tree though), age, as well as their birthplace. All and all, there are a lot of micro-simulations going on for each person of the island. When there are 200 or more people, it can be quite a headache to keep them all happy. And let me tell you, I usually am unable too. The Almanac: Luckily, there is this tool that helps generalize, and categorize the people of otherwise equivocal needs on your tropical paradise. It also lets you see how close you are to reaching your overall objective for the mission or the score for free-play. You can look at detailed statistics of your population, arranging them in to graphical overlays of education, or sorting them by political faction. While detailed there are still wants to be had. This is no Excel, nor is it a Google Stock chart. You can watch charts that show popularity over time, and click on and off different factors such as housing’s affect on it, but these things are mostly useless for me. It would have been nice if I could scale the chart freely to see my lifetime happiness as it progressed over time in relation to the other factors, then move it to just the current month, not limited to a set time range. Furthermore, when sorting my population by say, intellectuals, I would have much preferred the game to count the people for me, instead of showing me graphical representations of the people lined up under titles. At least give me the percentage of people in each title per the entire population. These things would help me more accurate gauge the population on certain ideas. Same goes for unemployed/paycheck. At least you can click on the graphically represented people to see who they are in game. This is probably not very useful if there are 100s in the category, but proves the depth that some players could go into running their empire. Some parts of the almanac are genuinely useful, but getting there is somewhat of a forest maze. For example, to get to export prices, you have to go through 2-3 submenus, the same goes for finding out who is the leader of each faction and what they think about you. I didn’t even know factions had an actual leader that you could see in game until this week! I’m not sure how to fix that without adding more clutter to the overall almanac menu, but I’m sure it could be better integrated. Despite these hiccups in GUI accessibility, the almanac is very sophisticated and complete. You can find charts of happiness, threats to power, numbers of citizens, where their allegiances lie, how much they are eating, expenses, what kind they were, the economy of the island, how much I am making in each sector, how much rent is costing/making, tourism ratings and profits, and relations to the foreign powers etc. There is A LOT to look over. You could get very deep into the numbers and analysis of your island with everything they have included for you to look over. I’m sure it is useful to some power users, but I find that I ignore the almanac except for looking for specific problems and my player score. Still, I am impressed with how many variables the developers let you look up. Alright, now that all that is covered we can actually start with the reviewing part. This game is very complicated as it has many many MANY variables disguised under simplistic graphics. To me, this game has more things to look out for than Sim City. Pretty much the only thing that Tropico doesn’t have to manage that Sim City does is Traffic, though even then, you have to manage layout and distance rather than cars on freeways. 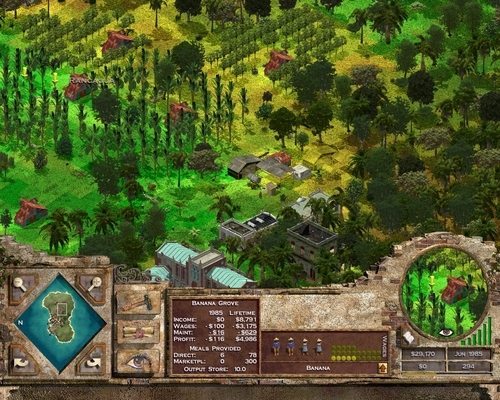 Graphics: Tropico is 3D and 2D. Ships are 3D with poor textures and some sort of single pong lighting. Birds are the same, though you can’t tell since they are small and don’t suffer from the lighting grossness that plaques the ships. The terrain is also 3D, as shown when the constructions workers elevate and terra-form it. Everything else is 2D, including the clouds that hover above the ground. The sprites are beautiful, as the walking and acting animations are clean, and each character has their respective job looks. This is cool because ala TF2, you can tell what class someone is/where they work, without having to think twice about it. The characters do twitch as they change directions, but it isn’t noticeable on the fastest setting, which I usually play on anyways. You can rotate and zoom the camera, though it is not free-flowing. This is fine for the most part, except it has the problem that most isometric games game, some things get blocked. The partial remedy is the “B” key, which makes buildings transparent, but that just makes them look like they could be under construction, minus the yellow hue. Still, it is better than nothing. I still find that to be slightly a problem on densely placed structures. 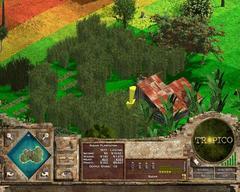 The game also includes all the tiny micro-simulation details which I mentioned above, such as the farming and grass. Workers stack up their products at their place of business outside, and so you can visibly detect which ones have output to be shipped. They are not a generic package either. Logging camps have logs that stack up, while the ranches output meat “things”. This style reminds me of another game, Stronghold, which uses the same mechanic to show food stores, and an efficient method it is. One last nitpick on the graphics are a couple of the characters, notable the dockworker have some sort of unclean walking transition where the shadow of the foot seems to stay in one spot till the animation repeats. Hard to explain, but noticeable on the closest zoom. In no way a game-breaker though. Story: There are mini-campaign missions which have stories, but there is no one main story. Each campaign mission has a different goal, but they are usually similar to as follows: Attract X number of tourists, Build X building, gather X number of Y. Though not a story per-say, the game does have a losing condition that is the same across every mission. Every 5-10 years there is an election. If you lose, you lose the game. Let me tell you, it is not always easy to win these things. In fact, despite the option to rig the election, you can still lose, though from slightly other methods. Choosing to ignore the election often leads to the same results. If the citizens on the island find the election unfair, and you won, they have the tendency to jump onto the rebel side and try and take down your regime. Not only that, your own military tends to be quick to follow if not happy. So pretty much it is game over if you don’t have enough respect among your own men and decide to cancel or rig the election. Overall, I found the elections to be quite frustrating. It was hardly ever the actual mission conditions I was failing, it was usually just the elections. I found myself having to cheat past the elections, to try and reach endgame. Quite sad. With the vast plain of variables mentioned before, it is difficult to get a majority, and harder to please everyone. 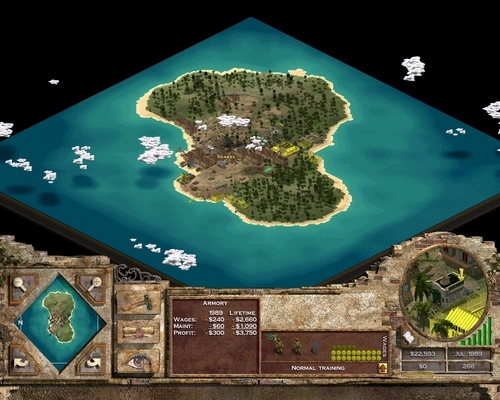 You can also apparently lose if a foreign power takes over your island, though this has not once occurred to me. The missions included though are quite fun, and although there is a limitation to the variations of winning conditions which aren’t just different values of other missions, PopTop kept the game flowing with interesting and witty writing, and some missions specific choices which could have any number of outcomes..
Controls: As I mentioned in the almanac, the GUI is both robust, and slightly a pain. Besides merely building things as a dictator, you can also do much more. 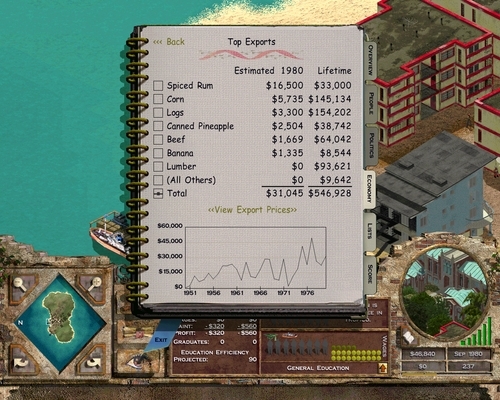 You have the ability to set wages per each job, and per building as well as the price of admission for that building. I loved the inclusion of this feature, but at the same time, having to choose specific values for each building seemed like an accountant’s dream and a nightmare for players. You can change them based on education level, but I rarely did. Thus, I left most buildings on their default wages and prices. I found messing with them caused more problems with the economy than it is worth and I’m not Timothy Geirner. (Random namedrop, whoot). In the same ballpark as the wages, you can edit some mini options about how each building is run. Despite the different names for the different jobs, it basically comes down to a couple repeated settings: Running the business for more lucre/maintenance cost for better overall satisfaction, working the workers for less time, changing the output/purpose of the business, and lastly keeping certain people out. I’m sure if I was doing a segregated town the keeping the “undesirables” out might be useful, but I usually don’t. As for increased maintenance costs for less population/increased satisfaction; later on when money is nearly a nonissue, you can pump these settings up just for the heck of it. As El Presidente, you must do the best for your people, or what you want. Edicts are your imaginary grip on the land. Building and setting wages are but one sense of control, edicts let you actually get some foreign policy magic working. Under this panel you can have people eliminated, always fun if you don’t care about winning, have people fettered, extend relations to the US or Russia, and enable a number of policies that help/hurt your relations with various factions. Overall, I don’t have any criticism of the edicts present, nor are there any that I felt needed to be added. I will say though that some of the prerequisites to use some of the policies are a pain to reach, but not all are truly required to win a mission. You can also control game speed. I have the same problem with this game that I do with Roller Coaster Tycoon and The Sims 3, the fastest speed is just not speedy enough (and in the case of Roller Coaster Tycoon, there is only one speed…). This means many of the longer missions are drawn out. Plus, you don’t have to do super micro-management like the game does of its own people, so you can usually just let it sit on the fastest setting till you have money to build something. Then you have to wait again, which is why faster speeds are needed. Also, the game pauses whenever you get a news brief. I would have liked to either turn an option on that keeps the background going when I get these, or a at least have a 5 minute limit before it automatically closes. This way, I can leave the game on and do other things, and still have my people slaving away. I might get voted out of office, but that’s what autosave is for. Sounds and Music: If I had to choose one thing about this game that truly made it remarkable, it would be the music. Every time I hear the main menu theme, it makes me just want to jump back into the game, regardless of how much I sucked at it, or why I stopped playing. The music washes away all doubts, and I’m back again. I suppose my last Video Game Menu Music is one reason this review/strategy article is being written. The music is hard for me to explain, it just feels like it belongs. Apparently the expansion added more music to the game, but it continues to fit so well that I hardly noticed an extreme variation in style. Out of all the songs, I love the main menu one the best, but there is also an upbeat rumba song that plays every now and then, and it makes El Presidente feel like he’s doing a good job. Clicking on each character results in them saying a few saying, nothing super impressive, and it isn’t different for the different jobs, which is a little disappointing, but overall, the character voices were unimportant. Tourists from the expansion pack are unique in that there appears to be various foreign language selection voices, IE Some German, French, and English accented ones. These are definitely a step up from the original game voices but not much more than that. Plenty of bird sounds inhabit the island, as well of the sloshing of waves. They fit naturally, so they are not noticeable until you find them audible when you ALT-TABed out of the game. Glad they are in there. The best sounds are the ones that you don’t notice; it is because they fit so well. It also would have been rewarding to hear the narrator read out the campaign text in his memorable voice, yet the text stays silent. I can understand how it isn’t possible for user scenarios, but put them in for the ones included with the game, pleeeease? Awwww. Conclusion: This conclusion will largely ignore what I have written and just try and put an overall view of the game. 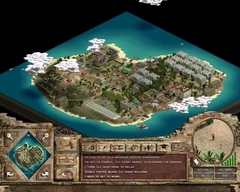 Tropico is a game for people who like economics, and who would love to have a subtle, and not so subtle hand in the way an island of technology-deprived people can live. You can set wages, you can change the living conditions, you can educate your population, or not. You can specialize in a couple different money markers, with some very cool micro-simulations going on in the background if you want to watch them. The almanac included to help run your people is a blessing, and also somewhat of a GUI mess. There is too much to manage, and at the same time, you aren’t really directly managing any of it. Music is wonderful and catchy, as well as the narrator’s voice. With so much included, it is a disappointment that some things were slightly overlooked/left out. If you love watching charts then look at no other game. 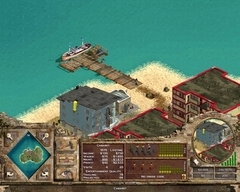 Sim City pales in comparison to some of the things you can manage here. 2D graphics are pleasant with minor issues, 3D graphics are just ugly. Some technical problems. Building just takes too darn long on the fastest setting, and without the ability to move the game faster than its current fastest, it is slightly annoying. (And no, I don’t want to build 10+ Construction buildings). Voting is both suitable for the game, but a large pain overall, and detracts from the campaign missions, better suited for free play. Witty humor is always a plus. Even if you don’t like to control everything, I still recommend this game. I can’t remember why I originally got this game, but all I know is that it is fun to play. The game can now be found on the cheap, sometimes maybe less than 10 dollars. He music alone is worth that, so why not get the game and have a vacation down south? Glitch: Just because I’m cool, I’ll let you in one a glitch I discovered. First of all, the furniture factory was in the expansion, so you may not have it in your game. I haven’t tested it with any other building, but let us continue with it anyways. Hold the furniture factory out like you are going to build it, but don’t place it down. Wait till some construction people come by, and they will try and build it. The building will proceed to get LESS filled in, and when it finishes will be a pile of rubble on the ground. Apparently my game crashed right after, so I’m going to blame that on this glitch. I held the building next to something else I was waiting to be built, and I did not have enough money to build the furniture factory, so it was red. I couldn’t get to it be repeated, though, it happened to me, so it could happen to you if you were trying for it. Might I add, you are looking quite powerful today Presidente! Yeah, I liked to build the farms on the green sections. Guess I was doing it wrong. I usually run out of money or have a military faction kick me out of office. Maybe since you are running the game on a 64-bit computer, the hardware option doesn't work. This game moves fast enough for me. Roller Coaster Tycoon is WAAAAY too slow. Sims 1 was slow, Sims 2 was decent, can't comment on Sims 3. Tropico isn't a casual game. There are a lot of complexities like you mentioned. I don't like managing the factions. I think they force one of them to hate you all the time. It's like me playing Sim Isle, the game is too difficult for me to make money. 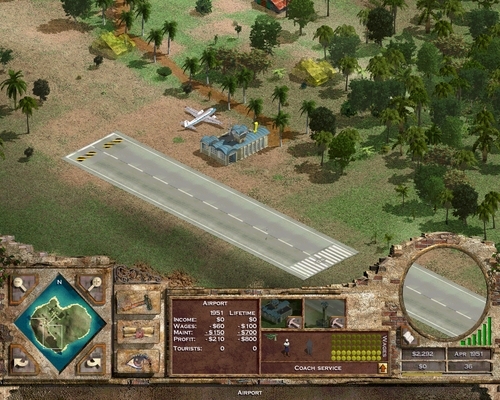 Building the airport is really an annoying task. My workers could never build it fast enough to for the escape the island mission. The music is really good. The main theme is catchy and the background music does really fit. Presidente, you are making quite a few enemies. The hardware graphics were always bonked. It didn't work on a 32bit system with a Radeon 9500 pro either, and that's much older than my 9700mgt in both structure and capability. It is even made by a different company. The Geforce 7800 OC wasn't any better. I think that the game wasn't programmed with these two hardware companies in mind when it was made in 2001. The introduction is completely misleading. Not only are there no cars, but Presidente is some sort of ethereal gas that floats through his door into his office. Then when you exit the game you go into your closet. The game seems to like to sap the CPU, guess because of all the things it has to keep track of. It is only single core though, so if you are on Vista and want to use all your CPU available, you can set the affinity to both CPUs under the process manager. Seems to work a little better, and haven't noticed anything wrong.